The City of Ontario accepts applications for open positions only. 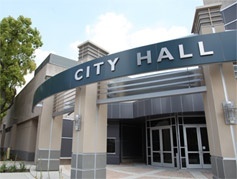 Open positions are posted on the Current Job Openings webpage and in the lobby of the Ontario City Hall Annex at 415 East “B” Street. Applications are completed online. For additional information regarding completing an application online, please refer How to Apply Online section below. An application must be submitted for each available position for which you wish to apply. A resume may be attached to your application but may not be submitted in lieu of a City application. Applications must be received by 5:00 p.m. on the closing date of the recruitment (unless the recruitment is continuous). The City of Ontario reserves the right, if necessary, to limit the number of applications accepted from qualified applicants. Depending upon the position you have applied for, the screening process may include one or more of the following: application review and evaluation, performance test, written test, and/or oral interview examination. Those candidates selected as best meeting the needs of the City will be invited to continue in the selection process. Candidates who successfully complete all phases of the selection process will be placed on an eligibility list. Current and future vacancies will be filled from this list. Lists typically last for 12 months but may be extended or abolished based upon the needs of the City. Eligibility lists are not applicable for “at-will” positions. The City encourages applications from qualified individuals with disabilities as defined by the Americans with Disabilities Act. Individuals who require a reasonable accommodation to take a test as part of the selection process must make such a request during the application process. Applicants with disabilities that affect sensory, manual or speaking skills may be provided with a test in a format that does not require the use of the impaired skill. People requesting reasonable accommodation will be required to provide documentation of such a need. A Special Testing Accommodation Request Form must be submitted to the Human Resources Department no later than the closing date of the recruitment (if any). Successful candidates shall be required to complete a verification form designated by the Department of Homeland Security United States Citizenship and Immigration Services that certified they are eligible for employment in the United States of America. The provisions of any job bulletin for this website do not constitute a contract expressed or implied and any provisions contained in this bulletin may be modified or revoked without notice. The City of Ontario is an Equal Opportunity Employer. The City of Ontario is pleased to allow applicants to apply for employment and volunteer opportunities online. You may apply online for the positions listed on Job Openings page and clicking on the job title to review details about the position. If you are interested in applying for that position, click on the "Apply" link! The first time you are applying using our online job application, you will need to create an account and select a Username and Password. You will also need an email account. If you do not already have one, free email is available through providers such as Yahoo, Hotmail and AIM mail (AOL). After your account has been established, you can build an application by clicking on the "Build Job Application" link. This application can be saved and used to apply for more than one job opening. Your application is the primary tool used to evaluate your job qualifications. It is important that your application show all the relevant education and experience you possess for the past 10 years. Applications will be rejected if incomplete. Collect details about your education and employment history before creating your application. The first time you create an application, be ready to spend 30 minutes or more, though you can save your work at any time and return to it later. Be thorough. List all periods of employment for the past 10 years, beginning with your most recent or present employer. List any experience that may help you to qualify for the position. List separately each position held, including different positions with the same employer. List and explain all periods of unemployment in the provided space. Resumes may be included but will not substitute for the employment history section. In addition, please ensure that you complete the supplemental questions if applicable, before submitting your application. Human Resources will not be responsible for incomplete applications that are submitted. Failure to complete these sections may result in the rejection of your application. Be certain to click on SAVE as you create your application. If you do not click on SAVE prior to reviewing your application, the information will be lost. Please print a copy of the job bulletin, any attachments and your application for future reference. Once you submit your application, a message will appear on the screen letting you know that your application has been received. Please keep this confirmation as proof that your application has been received. Online applications are stored on a secure site. Only properly authorized City employees have access to the information submitted. To access Frequently Asked Questions and instructions on how to apply, click here.